Simply put, grief therapy lets the patient process his or her feelings of grief and sadness with a professional therapist. Grief can arise when a loved one dies, a serious relationship ends, you lose your job, chronic illness strikes, you move to a new home, you give up an addiction, or after other major life changes. Your grief therapist is indispensable in helping you explore your emotions, manage your grief and learn coping skills. Knowing that giving up substance abuse is a good thing does not prevent addicts from mourning the loss of drugs or alcohol. To an addict, abstinence is like losing a friend, a way to cope with difficult situations. As with a death or other major loss, you must go through the grieving process, and the best way to navigate your grief is with the help of a trained, highly skilled therapist like those at Buena Vista Recovery. Acknowledging your emotions and feelings upon giving up drugs or alcohol helps you deal with them in a healthy way, which helps to prevent a relapse. Only when you’ve worked through your feelings and shed your relationship with drugs or alcohol can you begin your new, sober life. To heal feelings of loss, we typically go through five stages, not always in the same order or in the same amount of time, and not everyone goes through all the stages, but trust that you will move through these phases in your own way. Staying sober while you travel through the loss of your addiction is very important. How do the five stages of grief relate to giving up an addiction? Denial. You may deny your addiction, the fact that you need to go through recovery, or that you are depressed or feeling deep emotions about sobriety. Anger. There is no getting around the fact that beginning recovery and abstention causes anger and rage at your situation. Bargaining. Most addicts are accustomed to bargaining with a higher power to control their drinking or drug use, and they continue to seek a way to imbibe that is safe. Depression. You feel sadness and despair as you break up with your addiction. A professional therapist will help you understand that these feelings are normal. Acceptance. You accept that you are an addict and that you will never be able to drink or take drugs again. You move forward, learning to live without drugs or alcohol because you know this is the right road for you. Can Grief Lead to Addiction or Relapse? Yes, unfortunately it can. When an individual is suffering under the weight of extreme emotional pain, he or she may turn to drugs or alcohol to try to lighten the burden. But hiding or suppressing grief does not make it go away. If we don’t deal with the emotions unleashed by our grief, then we may be tempted to turn to drugs and alcohol in an effort to forget or ignore our grief. While substance abuse can numb our feelings for a while and provide a momentary replacement for our loss, it often makes us feel worse. Substance abuse arouses all sorts of negative feelings and thoughts — including depression, anxiety, guilt and shame — that can create room for a dangerous relationship with drugs and alcohol to develop or recur. 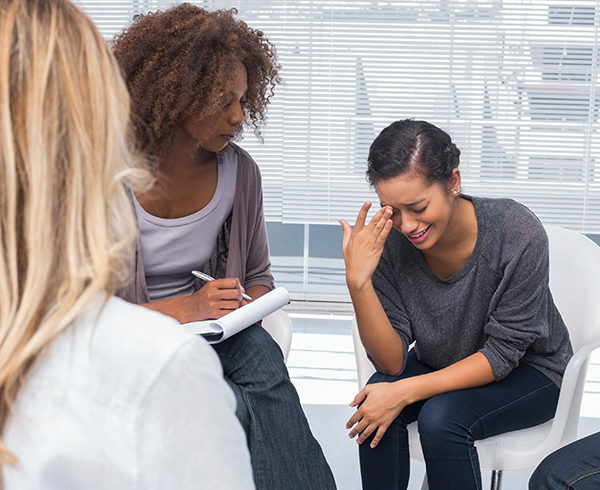 The professional grief therapists at Buena Vista Recovery are trained to help recovering addicts deal with the intense feelings and emotions that arise when giving up an addiction. We understand what you are going through and are available to help you deal with any roadblocks along your way to sobriety.